The North Shore is a cross-country skier’s nirvana. 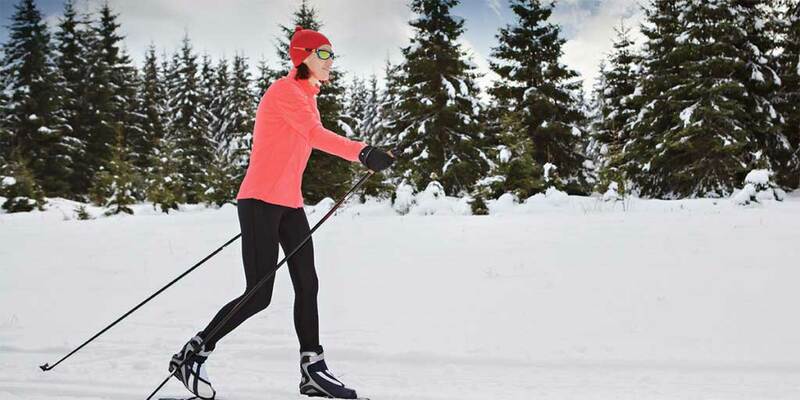 Hundreds of kilometers of cross-country skiing trails traverse hillsides, lakeshores, river valley ridges, pine plantations, deciduous forests, and alongside beaver dams. Options are unlimited. You can choose trails based on their length, the type of terrain they cover, your level of ability, and whether you want classic (parallel tracks) or skating stride. 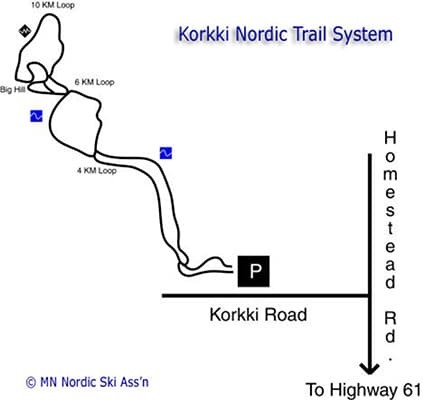 A Minnesota Ski Pass is required on all trails unless otherwise noted. Daily, annual, and three-year passes are offered. An daily pass currently costs $6, annual passes are $20 and 3-year passes are $55 and are required for everyone 16 and older. You can purchase passes at trail centers and businesses, by mail or online. Do not ski alone or let let someone know your route and expected return time. Carry a map of the system. Know your limitations – skiers can overdo it for the conditions, so you may wish to ski several short loops rather than one “most difficult” trail. All of the above are welcome on trails marked ‘okay’ for their use. Otherwise, choose a non-cross-country ski trail. 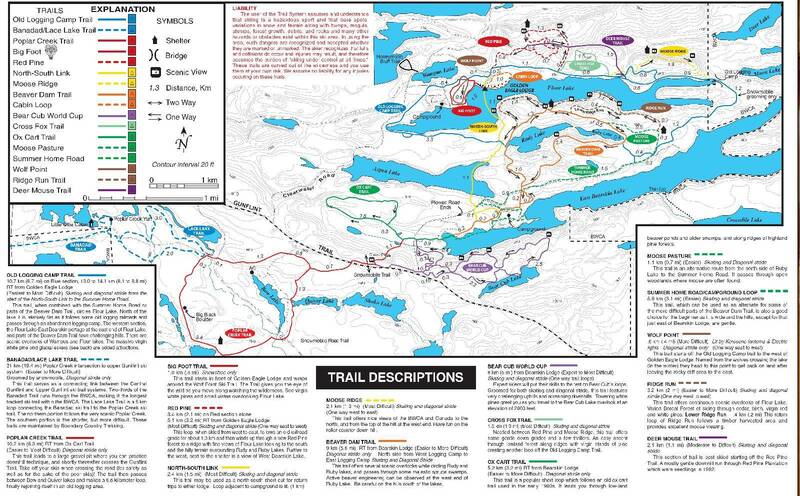 Check trail maps for details. Ski-joring or skiing with dogs is allowed on the Summit View and Upland Trails of Sugarbush and the East Overlook Trail at Pincushion and on the George Washington Trail. Winter hiking and snowshoeing can be done along the Superior Hiking Trail and on National Forest land that is not a groomed trail. 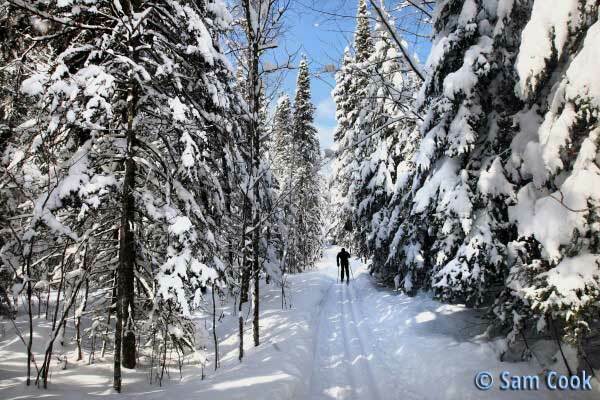 Offers a 4K intermediate and 6+K advanced loop through some rolling hills behind a Lake Superior ridgeline; a very pretty ski through the woods; trail system maintained by volunteers. Donations accepted and appreciated. Amenities: Warming shack, open hours vary. 4.5K easy to more difficult Outside Loop with a 1K expert loop and a 2.6K intermediate Inside Loop; trails run through the rolling hills of the golf course and a forest of paper birch, aspen, spruce, fir and cedar; plus a 3K lit trail. 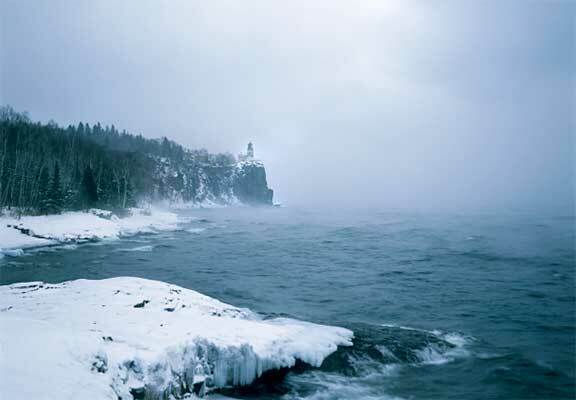 Split Rock Lighthouse has converted all their ski trails to Fat Tire Bike Trails, so head out for a winter ride! The park has ungroomed trails that are ski at your own risk. Crosby Manitou is perfect for the adventuresome skier looking to break some trail in a quiet, wooded area with variable terrain. Snowshoeing is also available throughout the park with rentals available at Tettegouche State Park. 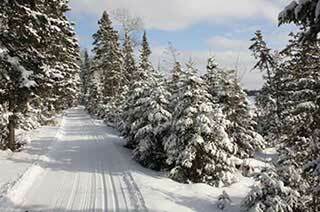 Enjoy remote, quiet cross country ski trails winding through 2,000 acres of Superior National Forest. 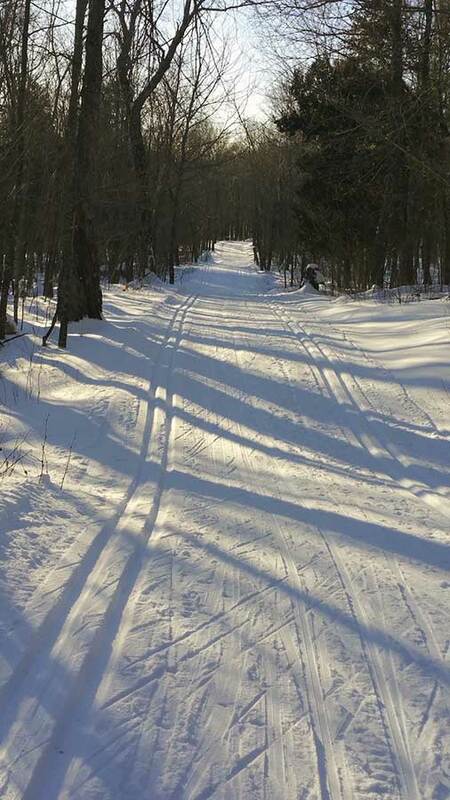 The trails are groomed for classical skiing and offer an “off the beaten path” alternative to many of the trail systems found in other areas. Moderate elevation changes allow skiers of all ages and skill levels to enjoy the big pines of the “Isabella Pine Belt”. Ski over the Little Isabella River on picturesque wooden footbridges. The area is off limits to snowmobiles so skiers can truly experience the quiet beauty of this remote area. 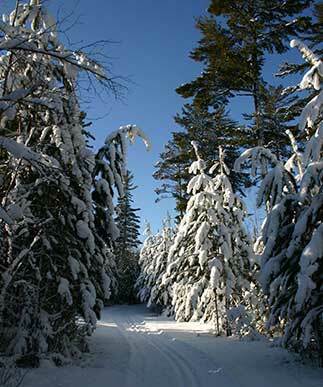 The trails wind through mature maple forests, mixed evergreens, and in the midst of North Country wildlife. 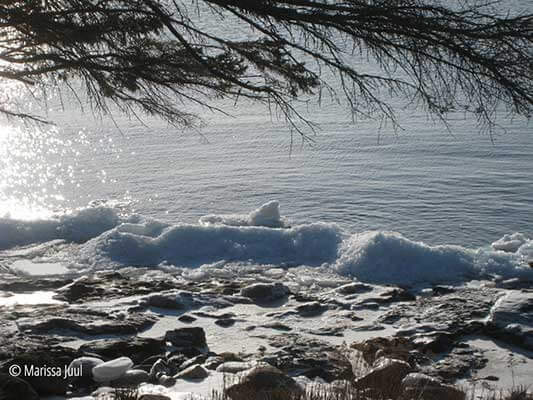 A number of the trails have spectacular view of Lake Superior and connect up to the Cascade River State Park Trails. Includes Deeryard Loops, Pioneer Loops, Hall-Massey and connectors. 27K Trails range from easy to difficult. One loop is available for the less experienced skier. Trails connect to other local trails outside the park. The West Overlook trail and the Stadium area are lit, providing night skiing until 8:30 Sun – Thu and until 10 on Fri – Sat. Plans are to have the Trail Center building open until the lights go off. 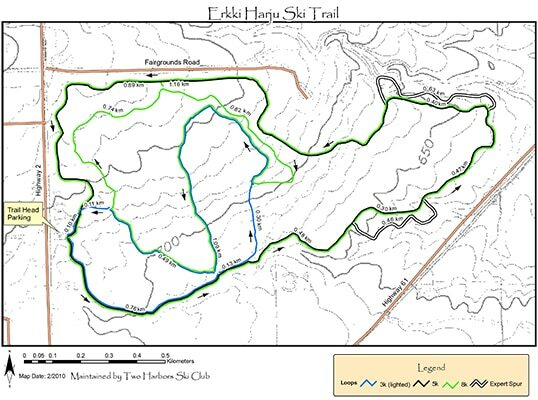 The majority of the trail system is tracked for both skating and classic skiing. Only two loops are tracked for classic only. The System consists of the 27 kilometer Banadad trail, a single tracked intimate trail through the Boundary Waters Wilderness, and another 12.3 meters of trails taking off from the Banadad’s eastern end. All the trails are single tracked. 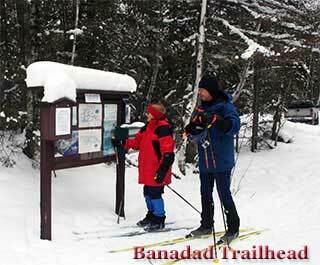 The eastern end of the Banadad connects with the Central Gunflint Trails and at the western end skiers can ski into the Upper Gunflint Trail System. Trail access for the Eastern Trailhead is located along the Little Ollie Road. 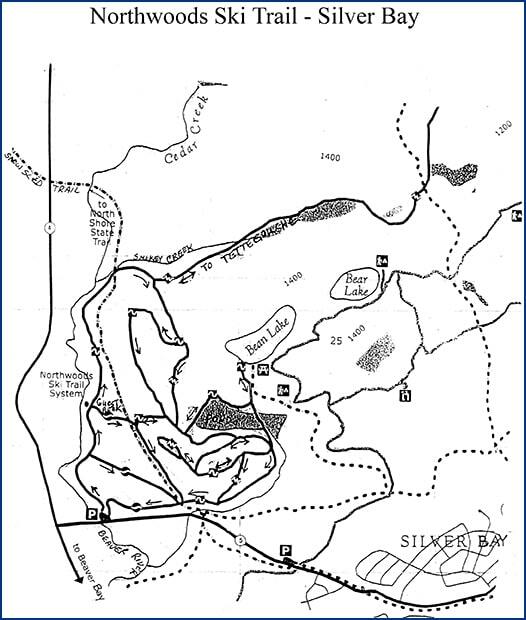 The Western Trailhead is off the Gunflint Trail, 1/4 mile south of the Loon Lake Public Landing at the Swamp, Lizz and Mead Lake Portages. 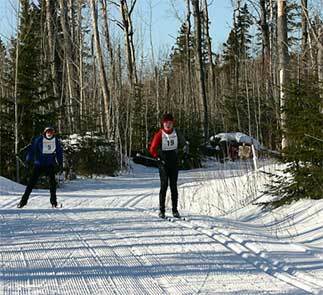 47K of intertwined series of loops provides plenty of skiing variety in a wonderful near wilderness setting. 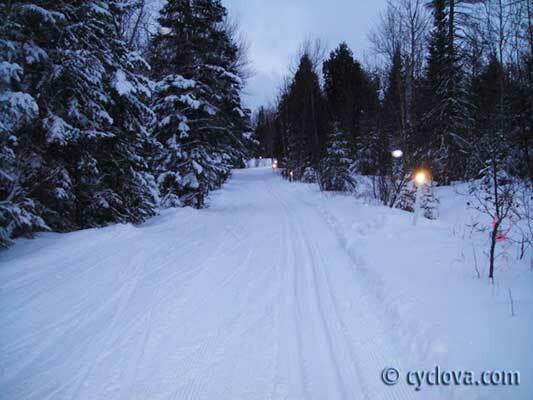 The easiest trails are near the lodges, which also offer short, lit loops; lots of easy to intermediate trails across the Gunflint Trail, through moose yards and the surrounding forested hills; more experienced skiers will like the South Rim trail and Highlands trail with Wipeout Hill, a big S-curve descending 120 feet to the Cross River.